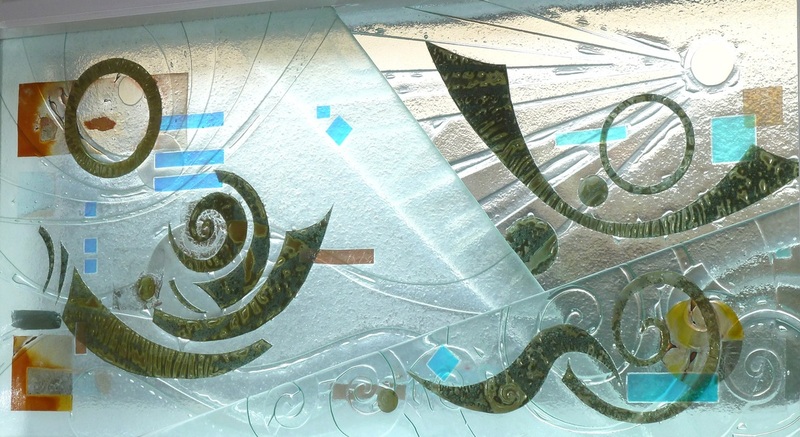 All our glass art works are individually handmade, so we can design and create to your requirements. We hope you are inspired by these possibilities. We love the challenge of creating the perfect artwork for the perfect place. There is always a "wow" factor when a specially designed piece brings a location alive. Set into an ancient , deep wall between two rooms. Intriguing because it looks so different when viewed from either room : rich bronze with a halo of green on one side ~ vibrant golds upon the other. 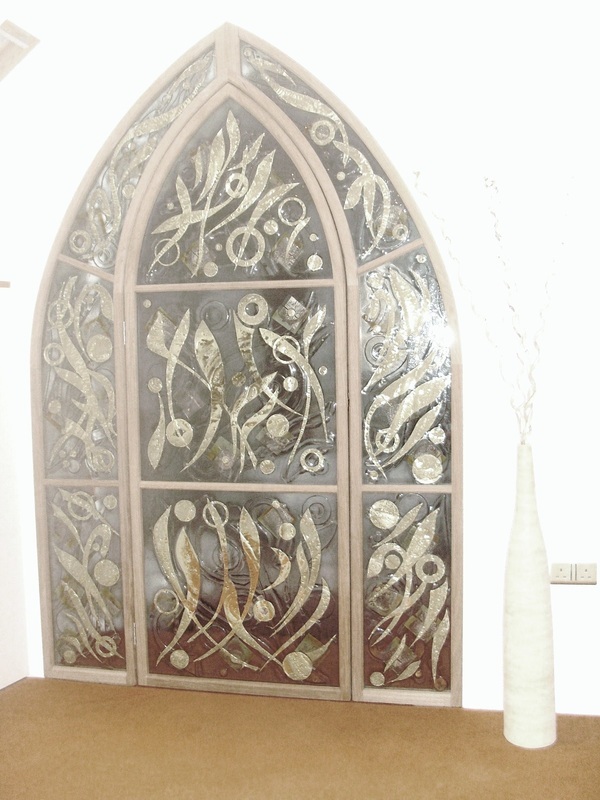 Beautiful take on a "stained glass window" for a bespoke new build home. 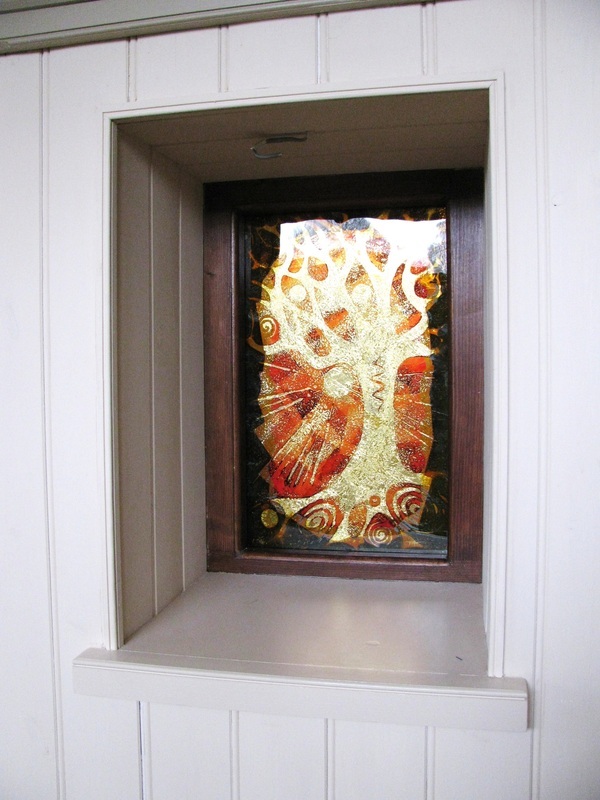 ​This duet of trees was specially made to grace a window high in the eves of a bespoke new build house. 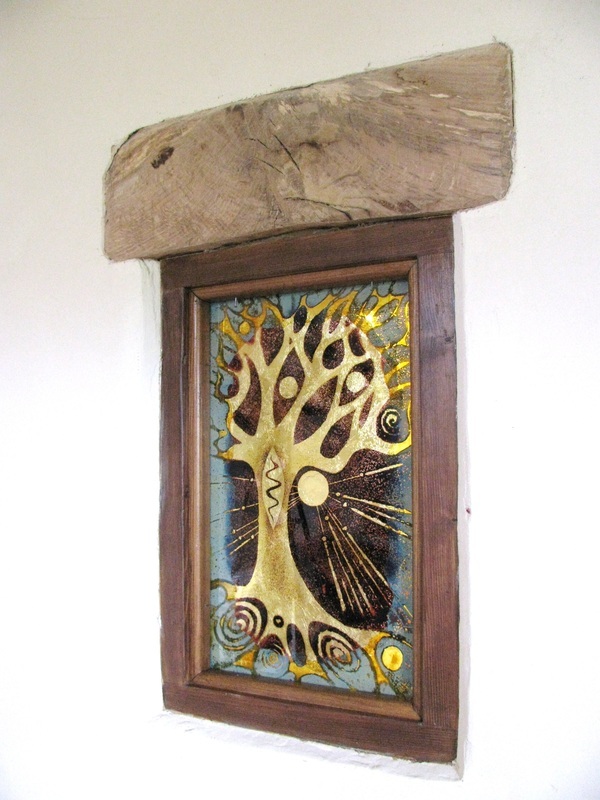 The tree silhouettes are inspired by trees in a neighbouring field seen from this lovely home . 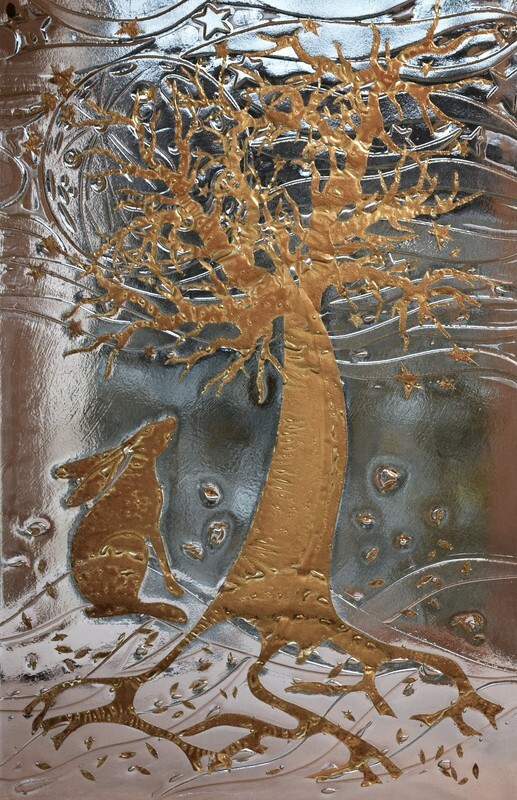 Those with a Derbyshire connection will be able to pick out Crich Stand on the sky line of the left hand panel : this was also specified as part of the commission giving this art work a wonderful sense of place. The photos show how the glass duet changes colour with every shift of light. 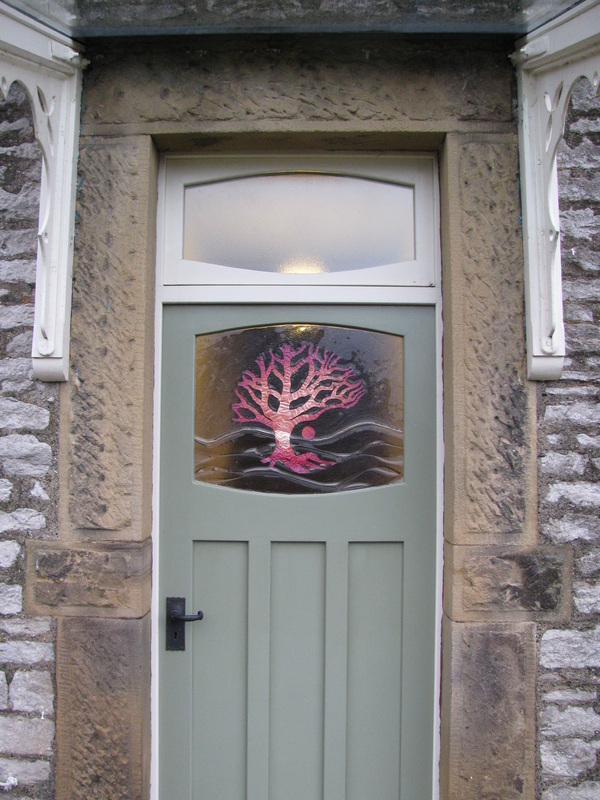 I saw this lovely door panel in situ for the first time when I went to photograph it on a rainy, cold Winter day. 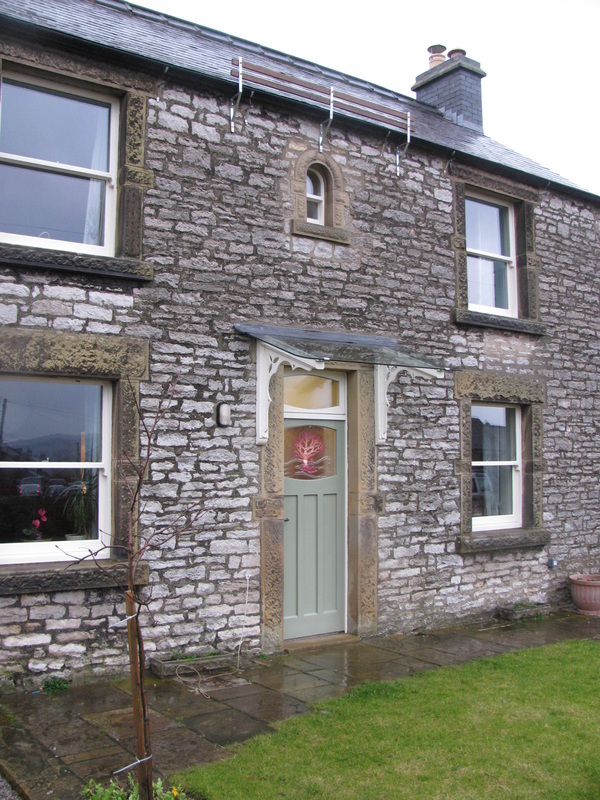 I was so happy to see how it transformed the front of this lovely stone cottage ~ a real focal point to the cottage and its garden, singing out welcome and homeliness. Even better, the owners of the cottage love it too. The colour of the flowers and planting reflects into the clear glass, generating an ever changing feast of interest for the eye and soul. ....... framed by a mounting board painted to exactly colour match the interior. Changing your colour scheme? Just repaint the mount to match. Window to create a " view "
Blocking an uninspiring view of just a brick wall was the top priority for this commission, replacing it with a beautiful " landscape" of light and rhythm. There is a hint of ammonite fossil in there too, as the homeowner is a Geologist. 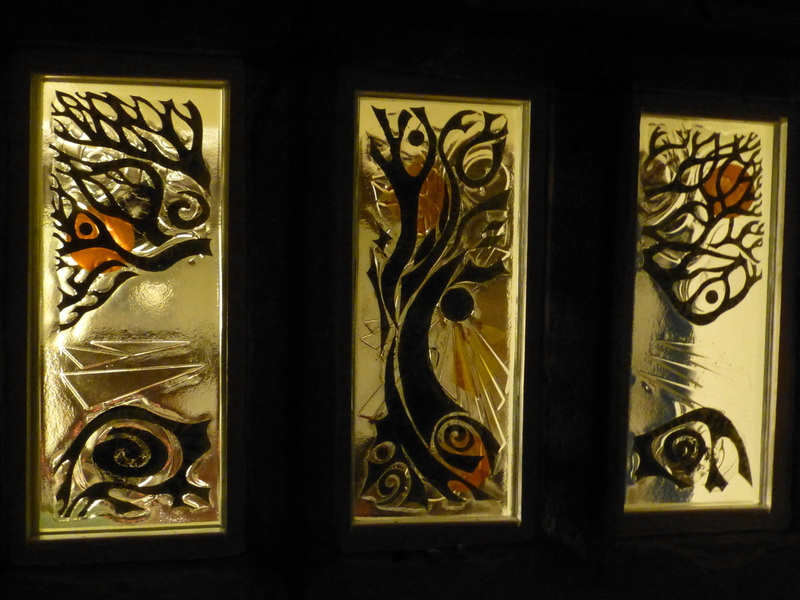 With light falling upon them at night, the precious metals fused into the glass shine out with texture and vibrancy against the darkness outside ~ unlike traditional stained glass, which just goes dull at night. 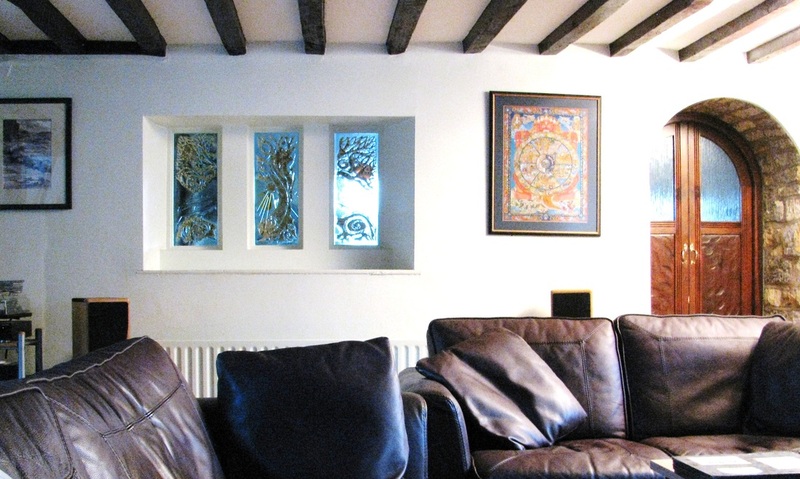 In each picture below, glass artworks are displayed upon a lovely original fireplace in an historic character farmhouse. This shows how "Seasons" artworks are equally beautiful on both sides as they are the same artworks turned over . And when the fire is out, the glowing gold keeps that warm homely feeling going.